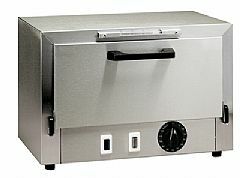 The improved technique for dry heat sterilization in the shortest possible time. Sterilizes instruments, needles syringes, dressings at 320 – 360° F (160 – 180° C). Sharp instruments remain sharp; no steam or moisture to corrode the finest edge. Exclusive internal-wall tubular heating system is burn-out proof. 115V AC. UL/CSA listed.